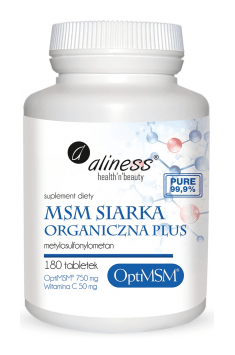 Aliness OptiMSM Organic sulfur PLUS is a unique dietary supplement containing the highest quality methylsulfonylmethane – an organic compound of sulfur and vitamin C. This product is extremely effective in sulfur supplementation and prevention of its deficiency, which has a beneficial effect on the condition of skin, hair, nails and articular cartilage. The preparation is characterized by high purity, obtained thanks to the multilayered distillation process. It also does not contain soy, gluten, lactose and is suitable for vegetarians. The presence of vitamin C, in turn, significantly increases the absorption of sulfur and makes the supplement even more effective. Vitamin C also shows synergistic action with sulfur in the scope of collagen synthesis and the promotion of joint health. Methylsulfonylmethane (MSM) is an organic compound, also known as dimethyl sulfone or methyl sulfone. MSM contains an organic form of sulfur, which guarantees its very good absorption by our body (non-organic sulfur is difficult to absorb). It is a safe and pure form of sulfur with very good solubility and no side effects. Sulfur is the seventh element most abundantly found in the human body. It is essential for life and preservation of healthy systems and organs because it is part of proteins, enzymes and other biologically active compounds. Supplementation with sulfur bound in methylsulfonylmethane (MSM) brings many health benefits – in particular to cartilage tissue, but also to the immune system, skin and nails. Sulfur is an element that is part of chondroitin sulfate and glucosamine sulfate. These compounds are the main components of connective tissue found in joint cartilage. They help to regenerate these cartilages, which is beneficial in case of the degenerative disease. Sulfur also participates in the synthesis of collagen and keratin. Collagen is a protein that is most commonly found in the connective tissue of the human body. It is part of, among others, the skin, conditioning its firmness, smoothness and delaying the appearance of wrinkles. Keratin, in turn, is a component of hair and nails. The use of this supplement will, therefore, help to maintain the health of these structures – it will ensure the proper gloss of hair as well as the strength and healthy appearance of nails. This supplement may also be of great importance to athletes susceptible to injury. Methylsulfonylmethane improves the permeability of biological membranes, resulting in a more efficient flow of tissue fluids. This promotes faster regression of edema and facilitates the supply of nutrients to damaged tissues. Combined with the analgesic effect of MSM (inhibits the transmission of pain impulses), these properties may prove extremely useful for physically active people. Sulfur is part of two amino acids – cysteine ​​and methionine, which are important for the functioning of proteins. Methionine is necessary to start the synthesis of polypeptide chains, while cysteine ​​is included in the cystine and forms the so-called disulfide bridges. These bridges allow the formation of protein tertiary structure, thanks to which they obtain their biological functions. Sulfur, therefore, indirectly allows the proper functioning of all enzymes in the body, hence its appropriate amount in the body is essential for life. MSM promotes the proper functioning of the immune system. It takes part in the synthesis of antibodies that fight infection and also shows anti-inflammatory and anti-rheumatic effects. It also inhibits the excessive immune response resulting from the action of allergens by blocking the action of histamine. In addition, sulfur contained in MSM is involved in the synthesis of glutathione, which helps to eliminate free radicals that are involved in the pathogenesis of many diseases (especially within the cardiovascular system) and cause faster aging of the body. Vitamin C (as L-ascorbic acid) is one of the water-soluble vitamins which has a synergistic effect with sulfur. It is essential for the proper synthesis of collagen, so along with MSM, it contributes to maintaining the proper condition of joints, tendons, skin, bones and ligaments. What's more, it intensifies the absorption of sulfur, making the supplement more bioavailable and enhancing its health-promoting effect. In conclusion, Aliness OptiMSM Organic sulfur PLUS is a supplement supporting the health of joints and ensuring a good condition of skin, hair and nails. This preparation is perfectly absorbable due to the presence of vitamin C, which additionally acts synergistically with organic sulfur. The product is recommended for people struggling with joint diseases, but it can also be useful in the care of hair, skin and its appendages. MSM Organic Sulfur Plus 180 tab. Take 1-2 tablets with meal. The product is intended for people who want to take care of the condition of their joints, but it is also recommended for prophylactic use when you want to improve the condition of skin and hair. You can combine this product with other supplements with a similar effect, e.g. with collagen or glucosamine, to maximize the effects.